On Noticing that one is Ageing. Eileen is with me this weekend. 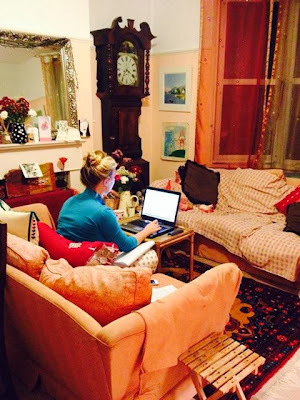 She is sitting next to me on the other sofa, with her laptop, and between us are two trays of tea. One for her and one for me. The house is empty. Giant Boy is with my cousin and his family, a long long way away in Oxford. Fancy Girl has gone to Australia with her boyfriend, even further away than Oxford, and my other son, Angry Boy who seems not to be so angry any more, is somewhere and still alive. My lodgers, all of them, work at night (no, not like that) and are peacefully asleep during the day. My newest lodger is passed out on her bed with the door open and is snoring peacefully. 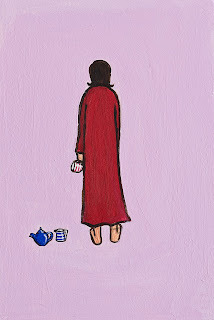 She came back from her night duty at 8am and having got into her comfy pyjamas, put on a load of washing. Only a half hour cycle, she said, I will wait till I put it all out to dry before I go to sleep. And now, hours after the half hour cycle has finished, my lodger has still not moved from her room; she lies on her bed where she fell, in her Eyore pyjamas, and from the open door comes the steady sound of deep snoring. There is peace in my house. I am thinking about what to eat when I am next hungry, and am satisfied that whatever it is, I have all the relevant ingredients in the kitchen, and all is good. It is nice to be old enough to have anticipated all my needs. I am thinking about ageing these days. 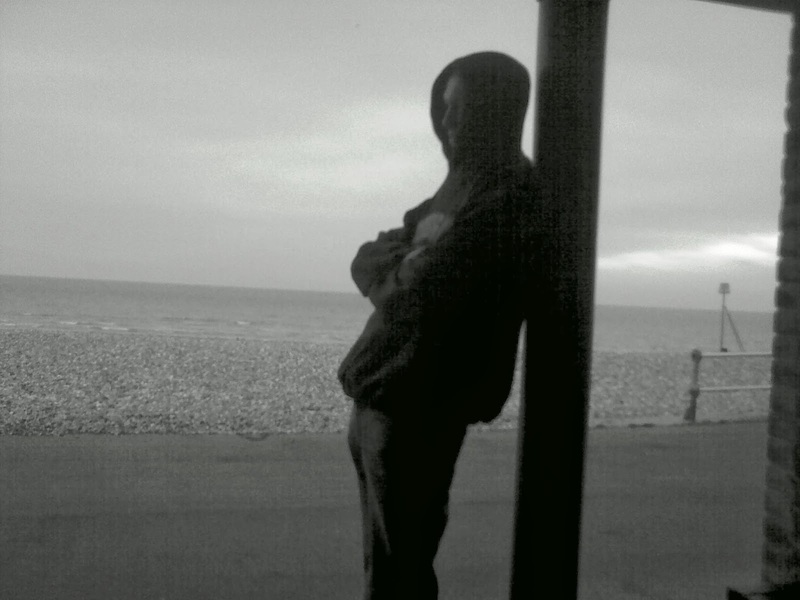 Me aged 40, taken by Eileen. I was a lot less wrinkly, a lot less sorted, and with my own hair colour. Eileen and I talked about it last night, she is thinking about it too. I am 53 now, and though my inner life is constant and astonishing, my outer journey seems to have caught up with me. I look in the mirror and see someone who really is 53. I always thought I just looked like me, and worried only as to whether I was fat or thin. Now I look at my skin and see it has aged and is puckered and falls in little wrinkles in places all over my body. My neck has become looser and the skin is wrinkled. My hands look like my mother's used to, bony and wrinkled. It is not a question of fat or thin now, it is a question of fat or thin and older. Whatever my weight is, my body is still older. Whatever I look like with my clothes on, without them, I am showing my age. If I don't dye my hair, I am grey. Goodness me, I say to myself, who is this lady in the mirror? I know it is me because the eyes are looking at me as they have always done, but I am beginning to doubt the rest of the evidence. I don't remember my chin changing shape like that, I don't remember my eyelashes becoming smaller, I don't remember all those lines showing up when my face is in repose. I used to see lines only when I laughed, or frowned, or changed my expression. 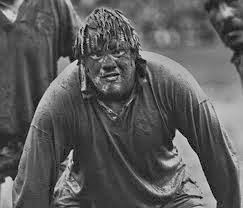 Now I am looking at lines, deep lines, from my nose to my mouth, around my eyes, at the corners of my mouth, when I am not doing anything at all. The face and body I have now is changing and taking me by surprise. I have recently lost a lot of weight. At last, I thought, I am the size I want to be. Yum. And with clothes on, I am just tickety boo. But do we ever get to be the person we think we should be? I have never really liked myself without clothes. Even in the past when I was very thin and in my early forties, I saw deep imperfections. I saw a body that was really quite unlovable, a body that didn't match up to the clothed version, a body to keep hidden in case anyone else saw it and was horrified. How sad, I think now, to have been so wrong. How sad, and what a waste. It shows much about my state of mind at that time, and I am sorry for that vulnerable, mistaken person with such a distorted idea of her worth. Now, ten years and much experience later, I have again lost weight and achieved a good body shape, and this time I appreciate it but, my skin has changed. I have varicose veins. My stomach is completely shapeless after having had three such large children (Giant Boy was nearly 11lb, the other two were 9lb and 9lb 1oz). There are no muscles there at all, it has always been a deflated balloon, but now it is even more obvious (to me) because the skin has become thinner and more marked. And so, I am happy with my size, but concerned about the inevitable and obvious signs of age, and feel that you can never win. Eileen was saying that women become less noticeable as they get older. More invisible, was what she actually said. How do I feel about that? I feel sad. On the other hand, what do I need to be noticed for? It is much more important for me to be taken seriously as an Artist Extraordinaire than to have someone size me up with a gleam in their eye. I don't want to be be invisible, I don't want to be too old to be attractive, and I don't want to be passed over. I suspect that my feelings of attractiveness are changing too, and the fact that my body is becoming, quite naturally, the body of an older woman, has made me think of time, of what time I have left, of who I am and what I want. Oh do we ever know who we are and what we want! We do, we get an idea of both from time to time, but life is fluid and unexpected, and what worked for us once, may not work for us later. Who we are and what we want develops, changes, moves on and does not stay static. I am now, at 53, happy with my shape, and quite happy to stay this way. But, I am aware that I am changing fast. What was just a theory, the theory of ageing, is now a reality. I will never go back to being younger. Being this shape and older is good but the attention I receive is different. I do not need nor want the same attentions as a younger woman, but I do want to be appreciated. Eileen and I agreed that we want to be respected, and listened to. I suspect that my best work is yet to come, which is a relief. It's nice to think that as I grow old and start to become a prune, my work may become more and more interesting. So here we are, Eileen and I, on our sofas, our combined ages are 106. I look over at her and think she looks just the same as she ever does, and I am not asking her if she looks over at me and thinks the same thing in case she says No. You are a wrinkled old bat, but you are very nice. We will stop to have our lunch and then because we are old and wise we will go into the studio and Eileen will continue to edit her new film, and I will paint the first of the True Fairies that I have been working on. No messing around for us. Time is ticking, we have work to do. I may be doing mine in smaller trousers (stretchy ones, they have to go over my varicose veins) and Eileen may look as she did to me when I met her at nineteen, but age is a funny old business, and it either spurs you on to do wonders, or it depresses you into doing nothing. Me, thirteen years later, aged 53, taken by Alan who is twelve years older than me and doesn't make half the fuss. My mother. At 83, she is beautiful and funny and old. 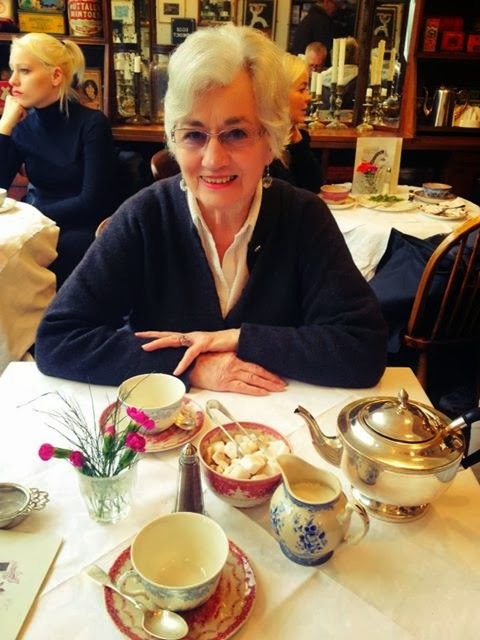 A good role model, and you can see where I get the tea thing from. 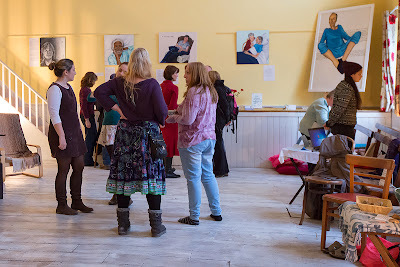 A Graceful Death and Soul Midwife Exhibition in Bridport. Come. We know where you live. Next Weekend. 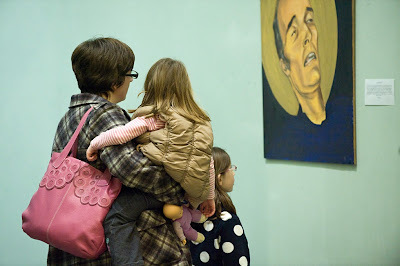 A family at a recent AGD exhibition. We, Lizzie, Eileen, Jackie and I open the exhibition on Friday 1 November, at 10am, and from that moment on, we will be going with the flow, hoping to see you all, and being excited about everything. This website tells you all what is happening, when, and with whom. What it does not tell you is that my new Hungarian Lady Lodger is making us some fabulous brownies, in bulk, to use for our afternoon teas. She is going to provide you all with brownies that will make you realise how alive you really are. 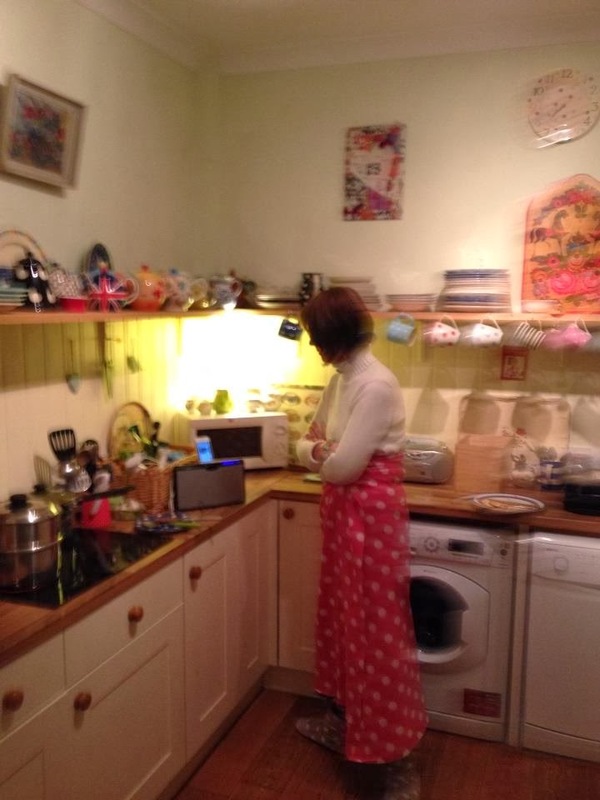 Recently she was spotted cooking in the kitchen and we all kept an eye on her, as the smells were wonderful. Later on, she let us try a bit of the chocolate brownies that she had made, and we all vied to become her best friend after that. So now, she has agreed to make a lorry load for AGD, and for you, from Friday onwards. The website does not tell you that we are looking for fairy lights to hang outside in the bushes at the entrance, so that you will be welcomed into a magical exhibition which we all know, is not magical, but has much love and passion in it. Nor that we are going to burn beautiful smelling candles, and that we will create the most lovely exhibition. We will be challenged. We will talk about death and dying, there will be difficult moments, but you will be held lovingly and kindly throughout, and there will be just as many jolly, happy and satisfied moments, moments of insight, of understanding, of acceptance and of sadness and remembering. You have seen this photo before, it shows the entrance to the Chapel in which AGD will be set up. I want to put lights out here, in the November darkness, to welcome you all in. Here, just to remind you, despite you having already clicked on the AGD Bridport website link above and thoroughly memorised everything, is the agenda. I am so happy to have such excellent Soul Midwives at this event too, and hope that you will come to take part in their workshops and talks. Friday 1 November 10am Exhibition Opens. Exhibition free, donations accepted. 11am stalls open. Cards, CDs, earrings, Graceful Gifts memorial items, books, gifts. Teas, coffees, cakes and buns available up in the exhibition area. Donations accepted. 7pm - 10pm Friday, Open Event. I will introduce AGD and speak a bit about working with the dying through art and what effect it has on them and me. 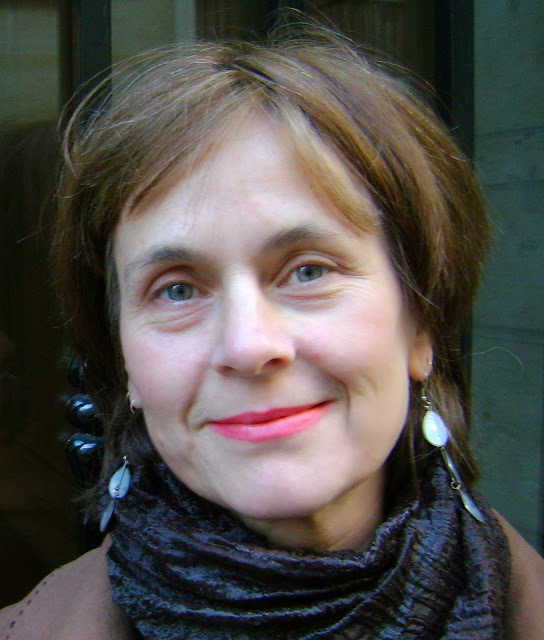 There will be readings of some wonderful poetry from the exhibition, and best of all - a piano concert by AGD Composer Lizzie Hornby. Saturday 2 November 10 am exhibition opens. Teas, coffees, cakes, goodies upstairs. Stalls open too. 10am - 11am Laughter Therapy Workshop with Mandy Preece. Mandy is a practicing Soul Midwife teacher and practitioner. 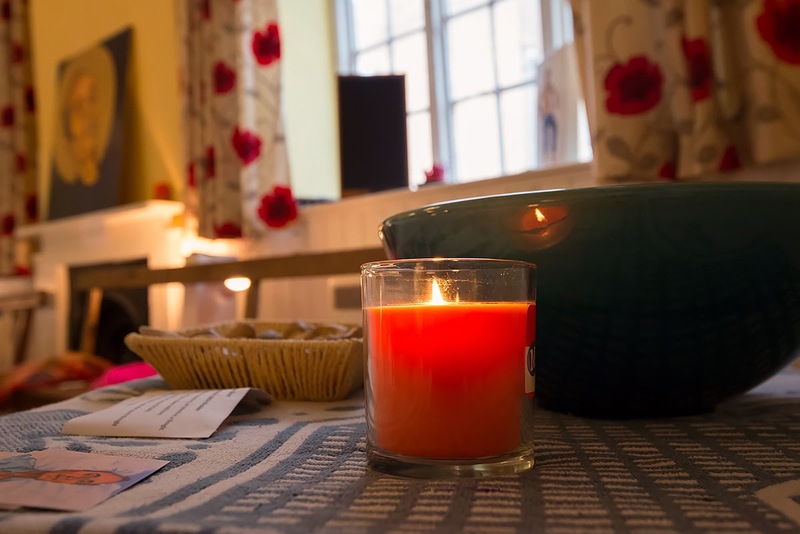 Mandy is an experienced, gentle, much loved and in demand Soul Midwife. £5.00 on the door. 3.30 - 4.30 Harp music played in the exhibition space by Jane Saunders, musician and Sound Therapist. Jane is a wonderful funny kind and talented musician, and brought her ukulele to my house recently to play some reggae songs. Of course it was barking, but fun. 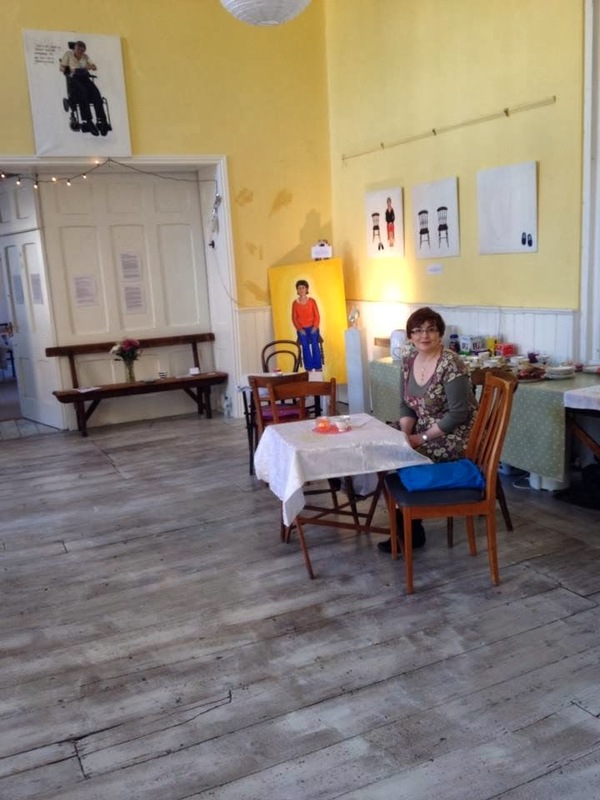 Tea and cakes will be on sale and you can rest amongst the artworks with Jane playing her harp to soothe and charm you. 11am - 12pm Service in the Unitarian Chapel, led by Unitarian Minister Lizzie Hornby, and a bit by me. I am delighted to be able to take part with Lizzie, and hope I keep up with her. Bring and share lunch for all, time to chat, to meet, chat, chill and to see the exhibition with a sandwich in your hand. The exhibition is held just behind the chapel itself, up the stairs. 2pm - 3pm Sound workshop and sound bath by Soul Midwife and Sound Therapist Sarah Weller, up in the exhibition space. Everything provided, just turn up and be amazed. Sarah is wowing everyone with her Sound Baths! We love Sarah, she works a lot with AGD, and also takes her gongs and bowls to all places for all people all the time. Sarah is also a Soul Midwife. Gentle much missed John Horne, part of the AGD exhibition. It is his daughter and granddaughters that are looking at the painting at the beginning of this blog. I travel down with Eileen on Thursday and with Lizzie and Jackie's help, we will be making the exhibition as memorable, as effective, and as welcoming as possible. The setting up is always a total act of creation. We often are not allowed to touch the walls, and so have to find other ways of displaying the paintings. I propped them up on piles of old books against the walls once, in a lovely old room that was used as a tearoom, in a big old manor house. If we can't use the walls, I have ways of adapting the exhibition so that it still greets you, still works and is strong enough to speak its message. 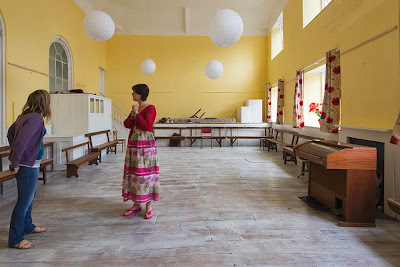 In the Chapel in the Garden in Bridport, I will have a lovely large room in which to play, a staircase, a lobby area and a separate room where we will be holding the workshops and Lizzie's concert on Friday night. 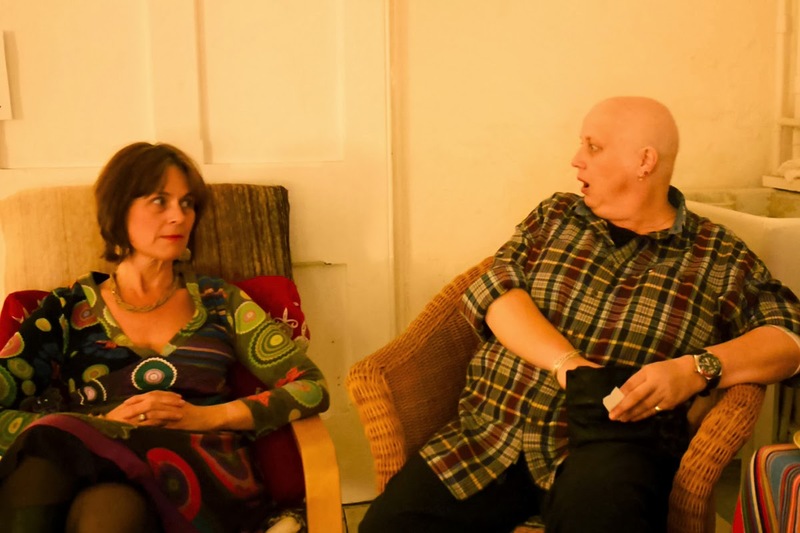 I will be displaying the new paintings of Mike and Julia with MND, of Claire and Kate Granger with Cancer. I hope I can play the films of Julia, of Mike, and the AGD film made by Neill Blume too. We are expecting Mike to come on Friday, and hope it is possible. This is Lizzie's piece composed for the exhibition, called A Graceful Death. The left hand plays the notes as if they were a heartbeat. At times in the piece, the heartbeat fades, becomes irregular, and then starts up again. Lizzie's creativity amazes me, and her adaptation of the AGD message into her music, is an example of how clever I think she is. Lizzie will be playing this and more, on Friday night, at the Chapel in the Garden Unitarian Church, East Street, Bridport. £10 on the door, and a glass of wine and nibbles included. You will, of course, have access to the exhibition and be able to talk to us all. You are all welcome. We hope to see you there, we look forward to meeting new friends, and seeing our old ones, and hearing what you think both of the exhibition, and of the end of life in general. A snap shot of this afternoon. I sit, as I do, on my sofa. Outside my window, the guard hollyhocks are smacking passers by in the face as usual and the wind and rain are making them even more unpredictable (hollyhocks, not passers by). Giant Boy is lying in a pair of jeans only, on the sofa opposite, eating pasta loudly and listening to South Park through headphones on his laptop. His legs hang over the end of the sofa from the knees and he is so obviously a baby dinosaur, that if I was not used to him, I would wonder how on earth he is kept fed and exercised. This dinosaur is laughing loudly every few minutes and I am trying not to react because the only other way for him to pass his time is to practice judo on me. I don't want to bring myself to his attention. We have a mantra here for when he gets too enthusiastic, "Mummy is for loving, friends are for hitting." When he is longing to throw me over his shoulder and when he gives me a wooden stick with which to hit him so he can fend off the attack with quick Bruce Lee type moves, I have to shout very loudly "Giant Boy! Mummy is for loving and friends are for hitting!" and then I run. He is on half term now and has told me he will be here 24 hours a day until next Monday. Giant Boy doesn't go out much, he is a home bod and wants nothing more than to see his mother fly through the air between meals. However, his mother is going to Bridport on Thursday, and won't be back till next Monday. He may have to find the Hungarian Lady Lodger and give her some Judo instead. Are We Ready to Talk About Dying? 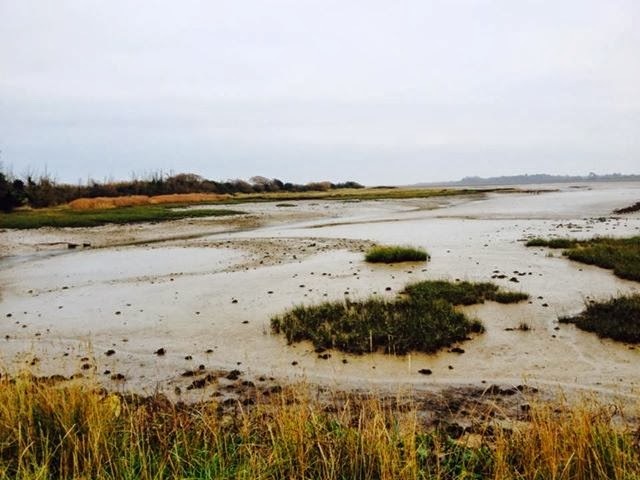 An article written by Katriona Feinstein from the AGD talk and exhibition at the Brighton School of Medical Science. I am sitting in a brightly-lit lecture hall in Brighton and Sussex Medical School, watching a woman use a green LED torch light to show areas of interest on a picture of a dead man. She draws our attention first to his still-moist lips and then to the bright spots on his jaundiced, sunken eyes. This is no medical demonstration. Our speaker is no woman of science. She is Antonia Rolls (left), full-of-life, self-professed Artist Extraordinaire. The picture is in fact a painting – hers – and in it she has depicted her beloved partner’s emaciated face minutes after his death, framed by a golden halo. I was not sure what to expect. Like many, I am used to thinking of death as something we all know is there, waiting in the wings, and that, probably, the best thing we can do is just to keep it quiet. Like an uncomfortable shared secret we know we’ll all be forced to listen to, loudly, at some point or another. Why not put it off until then? Antonia is on a mission to show us this attitude is not helping. Antonia Rolls’ partner Steve, the inspiration for A Graceful Death, whilst dying of liver cancer in 2007. 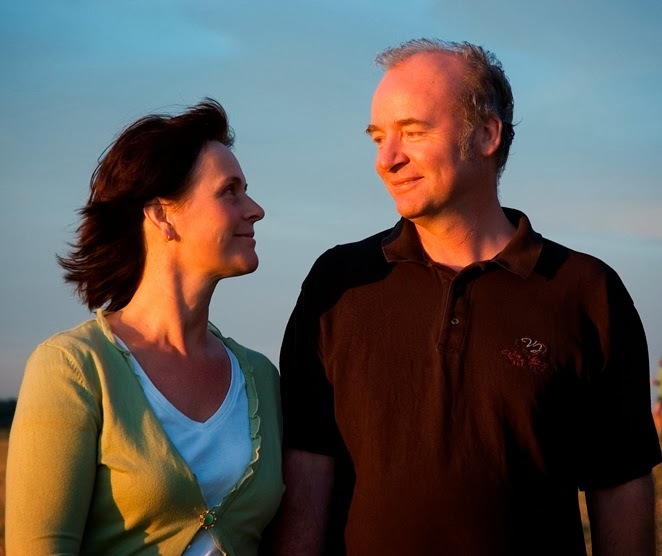 It all started for her in 2007, when her partner, Steve, was dying from liver cancer. Bewildered and angry, she did what she knew best and painted the last few weeks, days and the actual day of his death, “with no other aim than to survive and understand this terrible loss.” She never expected anything to come of these painfully honest depictions. “I didn’t think anyone would want anything to do with me if they saw them,” she said with typical wry humour as she showed us the first image of Steve’s deteriorated form. A Graceful Death – Paintings from the End of Life, Brighton and Sussex Medical School, 3rd October. And now, Antonia tours the country telling the stories that people want told. 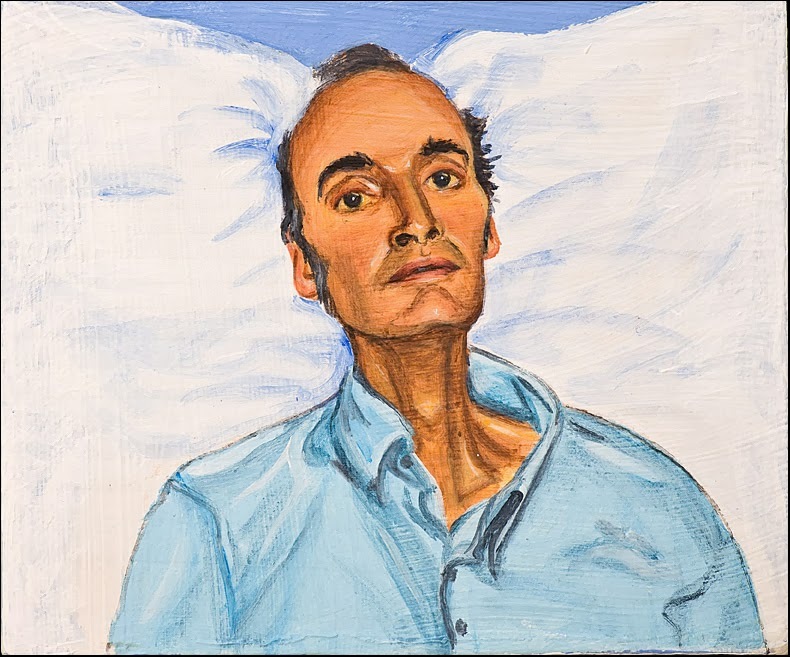 Since those early days, A Graceful Death has grown to include commissioned paintings of both dying and dead subjects, in addition to “Survivors” – those bereaved, or those who have endured a life-threatening illness. At her exhibitions and talks she tells each person’s story in charming and poignant detail, helped by poetry and snapshots of that person’s life and death, written by their loved ones. Her aim is to start a conversation about death and create a space where people can share their feelings on this often-avoided subject. “I don’t want to die!” she admitted readily during her talk. “It’s the biggest unknown.” But it is as much a part of everyone’s life as all the rest, she said, and accepting death is fundamental to having an easy one. In East Asia, Confucian philosophy helps death to be thought of as an inevitable part of Destiny. A man’s death can be considered less final through a belief that his family will constitute a continuation of his self. However, as Antonia pointed out, in our more individualistic western cultures, we do not have a tradition of acceptance and we tend to fear the topic. She believes we all have to deal with death at some point and most of us, through dodging thinking about it for years, suddenly have to go through a “crash course” on how to cope whilst at our least able to do so. She wants to use A Graceful Death to show that it is not wrong to talk about death, to cry, to get upset and to laugh. “There’s a lot of laughter in the exhibition,” she said, with a smile. Then there is the story of Hiram Burnett (right), a real character, strongly disliked by all of his children. On what was to be his final day alive, Hiram’s daughter Cecil decided to visit him in hospital after a long time apart. There Cecil finally realised that although she did not like her father, she loved him totally. She asked him if she could take a photo and he instantly pulled the cheeky face seen here in Antonia’s painting. Walking around the cold and fluorescent lobby of the Medical School, I could not help but be touched by these stories. Each person (or cat!) was given his or her own small, personalised section. Antonia’s great skill was to give each life a sense of truth and immediacy, through boldly-painted facial expressions and intimate accounts from families. The cherished slippers, rubber ducks and tiny perfume bottles hiding cosily in each painting were symbols of each of these subjects’ rich, various and funny existences. I found an inescapable feeling of brief closeness to each one. And yet death as a topic can still seem too raw to seek out. I was told that some who had booked to come to the exhibition could not face entering the building. It is certainly true that a few of the paintings are uncomfortable and haunting. One in particular shows Steve in the bath with rubber ducks. She writes that here the illness had taken hold of him and he had slipped into another place mentally where she could not reach him. He looks frail, uncertain and lost. I asked Antonia why people want to be represented in their dying states. Would their families not want a painting that reminds them of the good times? Are there not photos from their youth that could be painted? In spite of what society expects, “dying people do not want to go and die quietly in a room somewhere,” she replied. “Until they are dead they are very much alive and they each have a story to tell.” Many of them want to be seen, she said, and this is why they or their loved ones have approached her to ask for paintings from the last stage of life. I was surprised to learn from conversations with audience members later that it is also not uncommon to take photographs at funerals, in order to chart the very last part of a loved one’s story. They saw it as part of the acceptance of death. 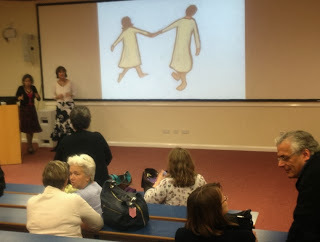 Although the subject matter may seem the heaviest, the hardest to understand and the most frightening, Antonia’s talk on her work for A Graceful Death and as a “Soul Midwife” (a spiritual and emotional companion for the dying) was in fact uplifting and cathartic. Despite such bleak content, the video and talk actually united the audience – which was an eclectic mix of medical students, doctors, mourners, clergymen and art enthusiasts. 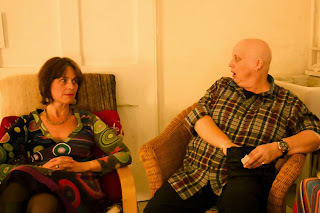 The evening was not academic or particularly philosophical (apart from encouraging openness). It was an appreciation and discussion of a spiritual experience that never became over-sentimentalised or centred on religion. Its focus was our entirely human reactions to death and our shared ability for resilience. In the context, it became life-affirming to watch Mike and Michelle chat on film about carrying on with their lives as normally as possible and Mike continue to tease Michelle through his computer-operated voice, as he always had done when able-bodied. After the talk, most audience members turned to their neighbours and asked them questions or comforted them if they seemed upset. One woman talked to me about her brother who had died young and I, usually reticent on such matters, found myself telling her about the song they had played at my grandfather’s funeral. I would highly recommend A Graceful Death as an unusual and unexpectedly uplifting experience. 1st-3rd November: A Graceful Death and Soul Midwife Exhibition, Unitarian Church, 49 East St., Bridport, Dorset, DT6 3JX. 16th-17th November: A Graceful Death and Sound Therapy Workshop, 113 Marshall Avenue, Bognor Regis, PO21 2TH. 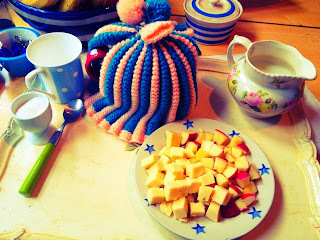 A Blog in which I say as little as possible. Happily, but wearily, back on the sofa. I have been talking to Giant Boy. "Giant Boy," I said, "I do not know what to write." He is sitting on the floor as I lie covered in pink woollen blankets and cushions on the sofa. He is doing his college work, and I am staring into space. It is pouring with rain outside, and I watch the guard hollyhocks sway dangerously in the wind, keeping the unwary from the door unless they know that they are there, or they find a different way into the house. The heating will not go on until sometime later and I have just noticed that it is 4pm, and probably time for tea. What is happening? You ask. How is it that you do not know what to write? I will answer these two questions briefly and in order. Perhaps a little bit of context would help. I have been exceptionally busy recently. I have been organising, arranging, writing, interviewing, speaking and being proactive. My mind has been filled to the brim with exciting thoughts, and I have found extra minutes in the day to call people up and tell them about these ideas. "Hello!" I say on the phone to a friend in the evening, at supper time, for example. "Put down your soup spoon and listen to me! I have another idea!". Sighing faintly, my friends do listen, because they are kind and they love me. And so it goes, until, I get a free Sunday (today), when suddenly I find I can no longer speak. My head is very tired. There are no thoughts in it at all, and you could hear the wind whistle through it, so empty has it become. Add to this, I have not slept so well recently, and we can see that I am a little below par. Pooped, as they say. The event is held in the Unitarian Chapel in the Garden, and will be filled with the AGD paintings, tea and cakes and a small gift shop. We have a talk on Soul Midwifery by the founder of the movement and author Felicity Warner, we have a fabulous concert by Lizzie who composed the music for the exhibition. 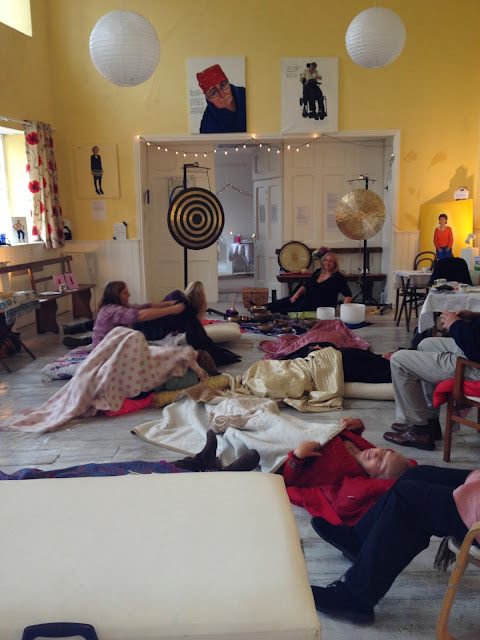 We have a laugher therapy workshop by Soul Midwife teacher and practitioner Mandy Preece and we have a Sound Workshop and Sound Bath by Soul Midwife Sarah Weller. The Opening Event is set to be a fab affair, with a piano concert by Lizzie, who will be playing music from her latest CD, and I will be talking about what I do and why, who are the people behind the portraits. The exhibition is running from 10am on Friday 1 November till 4pm Sunday 3 November. All the new paintings will be there, plus the older ones, and there will be much to talk about, much to think about and time and space to in which to do so. My team for this event are Musician Lizzie Hornby, Photographer Eileen Rafferty and Fabulously Helpful Jackie Keogh. A round of applause for them, and another when it is all over. Outside the Unitarian Chapel in the Garden in Bridport, host to the next big AGD exhibition in November. You will be able to get down the path without me standing in the way longing to hug you. I will behave. On Tuesday, I am taking part in a Schwartz Round at the Hospice where I volunteer. This is where the medical, social and volunteering staff all meet and talk over a difficult topic that comes up in the Hospice, and see how we deal with it. There is a panel of about three who have a story of how they experienced the topic under discussion, and the rest of the room then talk it over. I am on the panel this week and the topic is "when things go wrong". But I know nothing about that, I told them. You are dealing, I continued, with the Artist Extraordinaire, and things simply go right. All the time. No one believed me, and I am on the panel with a story of my own, of how something went wrong. And now. I am still on the sofa. Night has fallen, and the heating is on. I have been asked to write a tiny piece on AGD for the Dying Matters magazine Farewell, and I have done so. Feeling as tired and blank as I do, it was a struggle not to send in a piece saying that I haven't a clue, and I can't remember anything about it. I used small sentences and short words, and I think it worked. Thank you to Farewell Magazine for asking in the first place, I am delighted. A very perceptive and engaging piece has been written about the Brighton School of Medical Science AGD last week, by Katriona Feinstein. She has asked for some more bits to finish the article, which I will write that and send over tonight. Then, I hope, it can be published online and wherever it can be seen. I have known Kat since she was 7, and I loved her then and love her now. She is well over 7 now, in case you think I make kids write articles about me. "paintings I made during my A levels and art foundation. The painting of just his face I painted after his death during my foundation and the coloured paintings before during my A levels. Interestingly enough I never made the connections of colour and lack of it till your talk. I felt more at peace after painting him I now realise. 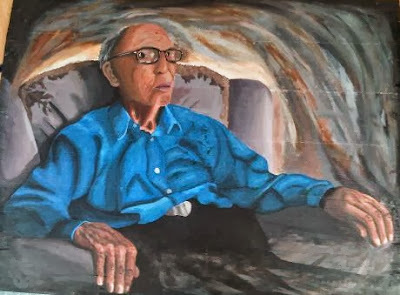 Louise Byfield's Grandfather, painted as he was dying, for her A Levels. I think this is just wonderful, thank you for sharing it, Louise.